The Little Holmby fixer at 642 Thayer Ave., LA CA 90024 received a price reduction this week of 6.91% or $115,000, down to $1,550,000. 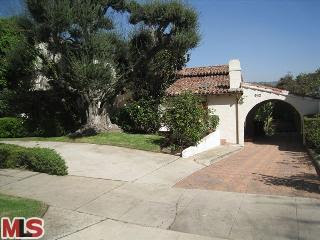 This is the 3rd price reduction of the listing term that started 175 days ago on 9/30/09 for $1,995,000. According to the MLS, the home is a 4 bedroom / 4 bath, 3,485 sq ft of living space on a 7,927 sq ft lot. This Spanish home was built in 1928 and basically hasn't been updated since it was built. Which would probley classify this house as a major fixer or even a teardown to some.